A chance to pick up an awesome sounding sound card that sold originally for $ thousands for a fraction of the original price. These cards offer both digital and pristine analog signal interfaces and can work with either balanced +4dB or unbalanced -10dB gear. The connectors are regular 25 pin ('parallel') and 15pin ('VGA') types so you can pick up the plugs for your cables for a couple of bucks at Radio Shack etc. Alternatively I may have some suitable breakout cables listed. Great for a variety of audiophile or broadcast sound applications! Drivers and documentation are available here. Windows versions later than XP 32bit are not supported. Please note that this is a full length PCI card which may require that you use a case with more than the average amount of free space behind the PCI expansion slots. 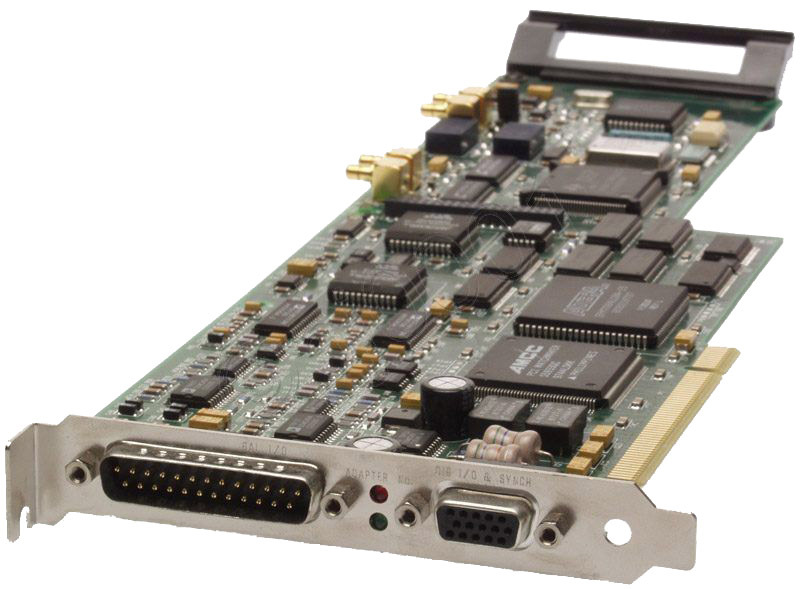 The Antex StudioCard AV Pro card (List Price $1,595) is a four, stereo channel, PCI audio record/playback board capable of maintaining perfect synchronization with video playback by employing either a master 27 MHz clock lock (when operating with the DPS Perception card) or by horizontal sync lock, by looping the video board's output through the AV Pro. This loop can automatically detect PAL or NTSC, thereby enabling the AV Pro to be used worldwide. Up to four AV Pros can be installed in one computer, each linked to the other and to the video card for perfect synchronization of up to 16 stereo tracks. The Antex AV Pro creates a virtual mixing board of 4 stereo audio tracks, with maximum quantizing at 32 bits and sampling rates up to 48 kHz (lower rates supported). The 40 MHz floating point DSP chips (TMS320C31) support A/D conversion at 16 bit, 64 times oversampling and D/A conversion at 18 bit, 128 times oversampling. Frequency response claimed is 20 Hz to 20 kHz with a dynamic range of 95 dB and harmonic distortion at 0.005%. The card comes equipped with two D-sub connectors for connection to external devices, one analog, the other digital. Only two channels are digital record and playback capable and the system can automatically sense if the input signal on the first two tracks is digital or analog. Also included on the digital cable set are longitudinal time code (LTC) in and out, MIDI in and out, and an external clock input (BNC). The card is capable of providing SMPTE time code burn-in by using the video loop through and assigning the software controlled SMPTE read/write module to play through the monitor loop. The Mixer module is adequate though not abundantly featured. In addition to the four, stereo record/play level controls, there is a Trim control that allows for the clipping level of the analog input to be adjusted between +12 dBu or +24 dBu. Where the Mixer module shines is in its ability to configure the line controls, from software, for a very wide assortment of inputs. This is done with a pull down Mixer Adapter menu. The Mixer Adapter features selection windows for Source (DSP Clock, Internal, External HSync and Digital), allowing the card to sync to external sources by way of the widest range of configurations we've ever seen. These include, DSP for the Perception card, multiple DPS cards with and without the PFx optional accelerator, external sources connected to the BNC connector, HSync for VTRs and non-standard video cards, AES/EBU or S/PDIF digital sources, and even word clock frequencies of 32, 44.1 and 48 kHz. The Mixer Adapter also controls the SMPTE read, write and code burn-in features of the card with numeric readouts for in and out points, and concurrent MIDI conversion of SMPTE code. The Adapter also allows switching between consumer (S/PDIF) vs. professional (AES/EBU) digital pin configurations of the I/O cables (thus eliminating the need for extra patch work). Clicking the Timecode Options button brings up a detailed control screen dedicated to the SMPTE features of the AV Pro card, which include source (input) and destination (output) type (LTC, VITC and MIDI), Frame Rate (29.97, 30, 30 Drop, 25 and 24), jam sync options, and LTC Edge Rate (SMPTE or EBU). Two lines of VITC may be read, enabling the reading of encoded VITC data. As one would expect, configuring the source configuration different from the destination configuration will result in a conversion of source type on the fly. Simultaneous record-play (SRP) mode is possible on the AV Pro, allowing any of the eight tracks on each card to be selected for playback or mixdown record. If the operator opts for installing multiple AV Pro sound cards, the software for the Mixer can adapt to provide control of all the available channels. Although the Antex StudioCard AV Pro will operate quite well as a standalone audio system, most users will purchase it to augment an NLE or sound studio configuration. The AV Pro comes complete with WindowsNT drivers for Intel and Alpha machines ensuring compatibility with in-synch Speed Razor, D-Vision Online, DPS Video Action NT and Saw Plus. We tested the system with DPS's VideoAction NT with excellent results, smooth scrubbing and high system stability. The eight channel Antex StudioCard AV Pro offers superior audio record and playback quality for systems using a wide range of video capture-playback cards including Truevision, DPS and Matrox, for those requiring professional results and synchronization. Although the card and software do not offer batch capturing, sophisticated signal processing or remote VCR control, it does support the widest range of configurations available on the market, with the capability of executing sophisticated conversions between various NLE signal paths, such as SMPTE - VITC and compression type conversions.